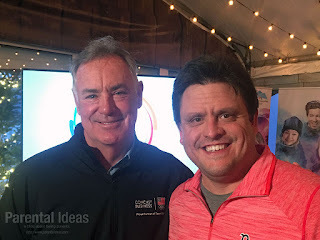 Olympic gold medalist Jim Craig and Dave. Last week, I had the opportunity to enjoy some delicious food and company at Boston Winter while learning about the new viewing experience available to all Xfinity TV customers. At any point during the Winter Olympics, you can take your X1 Voice Remote (available to all X1 customers) and say "Olympics Home" at any point to access the special Olympics experience. If you have the Xfinity Stream app for iOS or Android you can also take the Olympics with you! I love being able to watch my favorite shows via Xfinity Stream and now with the ability to stay up to date on the medal counts and latest Olympics coverage the app will be surely in use quite a bit in our house! At the event we learned about these great features, had the chance to hear from special guests 1980 USA Hockey “Miracle on Ice'' Olympic gold medalist Jim Craig and Consul General Kim Yonghyo from the Korean Consulate in Boston. We also enjoyed watching various curling clubs from the area give a demonstration of Curling, the sport where you slide a 40+ pound stone on ice and others sweep the ice so the stone can travel smoothly. I've always wanted to try it - who knows, maybe I will join one of the teams one day. 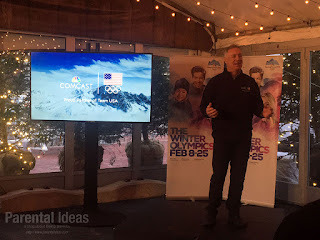 NOTE: I attended an event sponsored by Comcast Xfinity to learn about all of these new features for the upcoming Olympics coverage. No other compensation was provided and all opinions are my own.